We cultivate generous, warm individuals who have big dreams and who love their hometown. Through our continuous planning of lifelong learning activities, international exchange, artistic, and cultural promotion, we aim to support the lives of our city residents and become a foundation that is both vital and loved by the city's people. Through our planned activities, we create an environment of trust for our participants. We strive to stay informed of current events both inside and outside of the city. And as we continue to grow in awareness of what is needed by our city's residents we take action and create opportunities that reflects that growth and awareness. While we welcome and often incorporate new ideas that are beneficial to our growth, we remain consistent with what we aim to achieve. 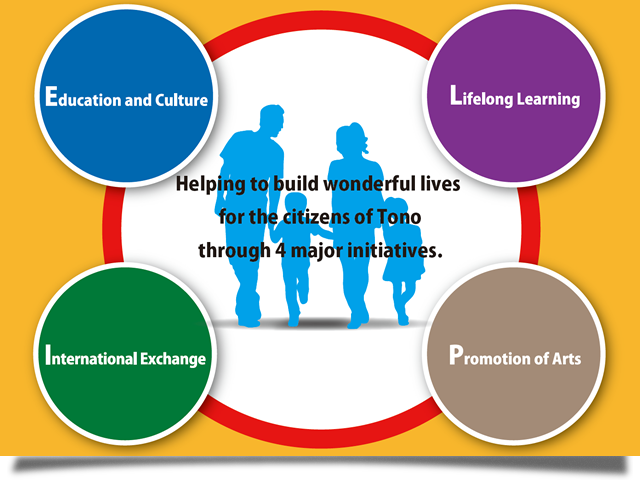 Our aim is to further promote education and culture in Tono City, and contribute to the development of a radiant and prosperous society. For the foundation to achieve our goals in management ideology, etc., we are engaging in the following projects described below. Projects such as international exchange and understanding, support for foreign residents of the city, exchange programs for sending students from the city for study abroad, and exchanges with Tono's sister city, etc. Lifelong learning lectures, child educational programs, go and shogi classes, collaborative projects with city residents, etc. Copyright © TECF. All rights reserved.